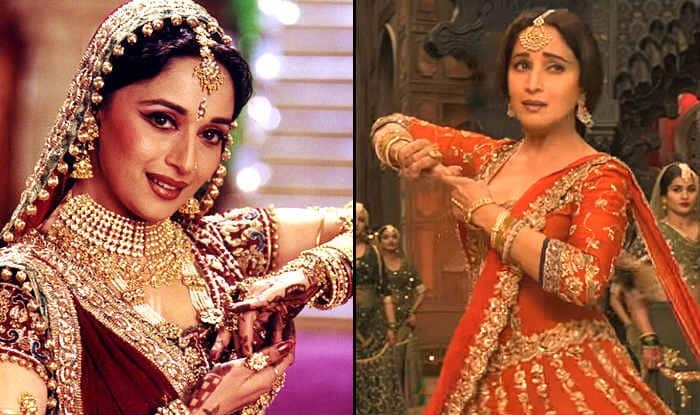 Madhuri Dixit comments on the audience drawing comparisons between her Kalank character Bahaar Begum and Chandramukhi from Devdas. Actor Madhuri Dixit is playing the character of a courtesan named Bahaar Begum in her upcoming film Kalank. The actor’s dance performance in song Tabaah Ho Gaye and the film’s larger-than-life appeal has reminded fans of Madhuri’s role in Devdas (2002). She played the character of a courtesan in the Sanjay Leela Bhansali-directorial as well. Madhuri was Chandramukhi. And now when she has once again appeared in a similar looking character, comparisons are inevitable. However, Madhuri says that while the two characters might appear the same on the surface, the audience will understand they are different once Kalank hits the screens. The actor talked to Mumbai Mirror in an interview and revealed that her Chandramukhi was more benevolent in nature but Bahaar is someone who carries ‘angst.’ Describing Bahaar from Kalank, she said, “Sometimes you take decisions that not only affect you but also the people around you and when you realise this, it causes a lot of angst. That’s Bahaar Begum for you.” She further called Chandramukhi a ‘giver’. Earlier, Alia Bhatt‘s mother, Soni Razdan also compared Kalank with that of an SLB film. When asked to comment on the teaser of her daughter’s film, the veteran actor said that the video looked stunning and it reminded her of the grandeur of a Bhansali film. Kalank is also reuniting Madhuri with Sanjay Dutt on-screen after a hiatus of 25 years. She talked about the chemistry that she shares with her Khalnayak co-star today. Madhuri said that they keep pulling each other’s leg the way they used to do earlier. The actor said he calls her ‘ma’am’ and she calls him ‘sir’. The 51-year-old actor also revealed that now that they both have kids, they have got many new things to talk about. Madhuri said she and Baba often discuss the education of their kids and share a cordial bond. Apart from Madhuri and Sanjay, Kalank also features Alia, Aditya Roy Kapur, and Sonakshi Sinha in lead roles. The film is a big period drama set in the backdrop of India-Pakistan partition. Directed by Abhishek Varman and co-produced by Karan Johar and Sajid Nadiadwala, Kalank is slated to release on April 17.